Prioritizing Your Car’s Needs One Step at a Time! We are a full-service auto repair shop in Gilbert located conveniently in the heart of our town at the corner of Guadalupe and McQueen roads. If you have been looking for a reliable, trustworthy neighborhood mechanic, then your search is over. 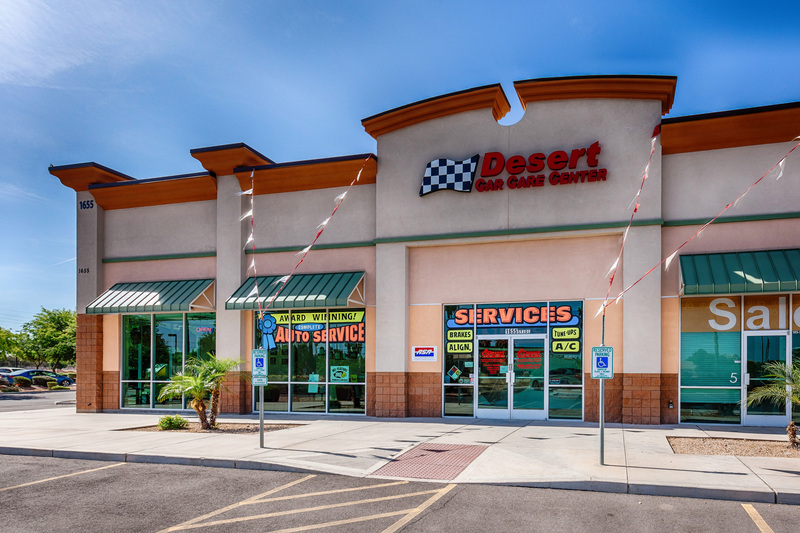 Desert Car Care McQueen is a family-owned business that prides itself on building a loyal and trusting relationship with its customers in Gilbert and surrounding East Valley cities. Our goal is to ensure every customer leaves Desert Car Care McQueen satisfied with quality service at an affordable price and no hidden surprises in the bill. Our auto repair services include oil changes, brakes, alignments, batteries, shocks, struts and suspensions, transmissions, tune-ups, AC service and repair and engine services. Look no further than Desert Car Care McQueen for full-service car repairs in Gilbert. Family owned and operated. We care about educating our customers! We use Angie’s List to assess whether we’re doing a good job keeping valued customers like you happy. Please visit by clicking this button in order to grade our quality of work and customer service. Chris said he was trying to figure out why his air conditioner was not working. He dropped off his vehicle and they looked at it the next day and said it might have just been the Freon. He then said it was a faulty compressor and that is a big cost, so he consulted with his wife and decided to do it. He had the compressor done the next day. They changed the belt and the oil change at no cost. There was excellent communication and a great cost. He has never dealt with a business like this and they went the extra mile and he felt like he was taken care of. Never have we had a bad experience with this company…always very friendly and never shocked at the cost of repairs. Will continue to have all 4 of our cars serviced here. I’ve been around the greater Phoenix area trying to find a reliable mechanic shop where I wont get the run around for things on my car that don’t need fixing or prices for parts/labor that are fair. I took a gamble on this place based on reviews and I’m so glad I did. These guys are knowledgable about various cars, and Mike specifically has walked me through the necessary repairs and upcoming maintenance repairs to keep in mind on my much older car. Mike and his coworkers take the time to explain what needs repairs and why, how it all works together for the function of the car and tend to my worries. Every time I’ve brought my car in, they are responsive and answer all my questions, the service is fast and they charge a very FAIR rate for their labor compared to ANYWHERE I’ve been in the greater Phoenix area. Better yet, unlike my other experiences, my car leaves the shop and the work done holds up and my car is running better than before I brought it in to these guys. If you’re looking for a mechanic that will be decent, responsive, reliable and fair in their labor this is the place without a doubt! The service manager Mike was so helpful when I brought in my old Blazer for a check up & oil change today. He not only helped prioritize my problems and maintenance but also saved me money on an issue that needed to be fixed immediately! Thanks for the great work and service guys!! I came in due to brake problems I was having with my car. I had gone to brake plus prior to arriving here who tried lying to me and charging me 500 dollars on a master cylinder plus more that wasn’t needed. Mike helped me out and literally saved me from being ripped off. He was super nice and made sure to take the time to get a right diagnosis for my car…It turns out I only needed my brakes bled and new brake pads. They gave me a great deal and were very understanding and very fair with prices. It’s hard to find a shop you can trust. I’ll definitely be coming back. A very honest shop with great customer service! Isaac said the business is very friendly and helpful. While he was waiting for his vehicle he could hear the service manager on the phone and he could tell they care about their customers because he was giving them options on what could be done.